Here’s a pic of me doing comedy in 2015 (if you can’t beat your trolls, make more jokes than them – see the video). 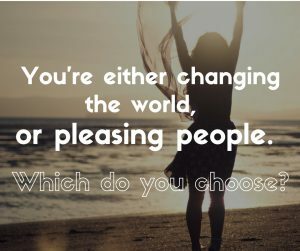 After all, you’re either changing the world, or pleasing people. Which do you choose? These days, I’m in an industry where I cop more criticism, but also have job satisfaction. In my experience, it’s better to find paradise on the edge of town than to fight for air in the city. 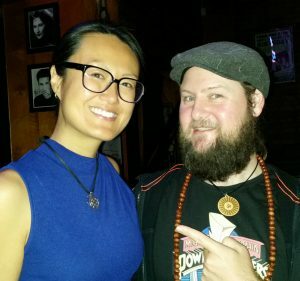 Sure, it can be a lonely life (less so now that my husband Kris has launched his Tarot business), but I also live my values of freedom, peace, simplicity and choice. Watching Donald Trump has been an eye opener. It’s lawsuit after lawsuit. Out of interest, I Googled ‘the most litigious countries’, and found that, although there is 1 lawyer for every 300 Americans (the highest per capita rate in the world), the U.S. is only the fifth most litigious country – behind Germany, which is first. Who knew? According to Clements’s website and the Norton Rose Fulbright’s 2015 Litigation Trends Annual Survey, conducted by Acritas, US-based respondents reported a more litigious business environment than their peers, with 55 percent facing more than five lawsuits filed against their companies in the previous 12 months, compared with 23 percent in the UK and 22 percent in Australia. So the good news for Australian business owners, is that we are still less likely to be sued than U.S. ones. That said, I’ve had many interesting refund requests over the years. For educational purposes, here are some quirky tales. Note: some details have been changed for privacy reasons*Early in my palmistry career, an older woman came to me for a session. As she revealed her hands, I realised she had NO LINES on her palms. Whoa! I’d read in books this could mean she was either low energy, or hiding from herself. Either way, I got a strange vibe, particularly when I asked her age. Her answer didn’t feel right – it seemed to be a lie, so I quickly offered her a refund. As I walked her back to the counter, I suggested she see another reader, for example someone who used Tarot cards. *I spot problem clients quickly these days, but when I started I sometimes got caught out. My red flags are someone who a) asks for a discount upfront (despite the fact I have a $100 deposit policy), and b) who keeps saying they ‘only have one or two questions’ (which is never true). In this instance, a person came to me, and spent the whole time asking if their lover would leave their spouse for them. It didn’t take intuition to see they were heading down heartbreak lane. As much as I tried to show them the big picture (e.g. that nothing external can EVER fill our internal void), they requested a refund as soon as they left my office. After giving back their money, I asked my Spirit Guides to never to send me clients like that again! Just because I’m a psychic doesn’t mean I have to put up with heavy energy. I’m allowed to pick and choose my clients to stay sane, that’s self-responsibility. *I get a preview of readings before clients come in, because I do their numerology by hand in advance. If I feel blocked, angry, head-achey or tired this is usually what they are experiencing. I also experience, or ‘know’ their energies in session – you could say I’m an empath. I’ll never forget the night I took my first dose of Dragon Slayer by Tribe of the Tree. This flower essence helps you conquer your worst fears. I am a huge fan of all their essences and sprays, and use them daily. Next thing, I dialled in for a reading and realised my client was surrounded by Spirits – not only did they start flickering my lights and ‘talking’ over Skype, I got full body goosebumps. Yikes!! I’d always avoided mediumship because I don’t like feeling ‘cold’ or ‘ghosty’ so this was confronting. After doing my best for an hour, I realised I couldn’t finish the call. So I gave her a full refund. Interestingly, she told me that ‘no one’ had been able to read her. Months later, she mentioned that she spent the refund on a very helpful healing. Yay! On my side, I called my mentor Caroline Byrd from Soulbyrds the next day and cleared my ancient, probably past-life, ‘fear of seeing Spirits’. It was life-changing – my readings are so much better now. You can’t say I don’t rise to a challenge. *Out of thousands of readings, only one or two clients have ever threatened legal action (for predictions which ‘apparently’ didn’t come true, years later). Having done my research, I’m confident that such a case wouldn’t stick – most judges would agree that psychic advice is advice, not a guarantee. The Queensland Government Office of Fair Trading told me the same thing, twice. It’s common sense that your actions determine your future – just because a psychic says something doesn’t mean it will happen – it depends on how you act on the information. If your GPS says turn left, and you turn right, you change the whole journey. So, don’t waste your time suing a psychic if you’re unhappy with their readings. Far better to call them and sort it out maturely – most decent readers will be interested in your feedback, even if they don’t agree to give your money back. Make sure you give specific reasons for your claim, otherwise you’re not playing fair. This is the reason I’m a fan of recording your sessions. It’s not so you can blame people for your outcomes, but so you can hear what the psychic is really trying to tell you. Occasionally, we have to use reverse psychology to get the message across, especially if you’re very defensive….Spirit works in mysterious and funny ways. It’s amazing how I bring up people’s mother stuff in readings, perhaps it’s because I’m very maternal and inquisitive – hence my article on forgiving your parents. Honestly, if I’ve offended you, it didn’t start here, it’s something you’ve been carrying for decades that needs to be surrendered. Don’t shoot the Spiritual Messenger! Based on my internet research, the only successful claims against psychics have involved massive fraud (as in, hundreds of thousands of dollars), such as misuse of credit cards by phone hotlines. FYI, Professional readers like myself have public liability and professional indemnity insurance as general business practice, which is a necessity when you do festivals and market stalls. *Occasionally, when a client is extremely tired, dehydrated, emotional or hungover, the reading will go slowly or prove difficult to complete. On a case-by-case basis I may postpone sessions, schedule extra dates, give a partial refund or refer people to my colleagues. I prefer that someone has a positive psychic experience rather than a crappy one which turns them off the industry forever. I should mention that I now have a 72 hour policy – cancellations within this timeframe incur a $100 fee however in extenuating circumstances I waive this. Did you know? Sensitive people may feel nervous, have trouble sleeping or manifest challenges before seeing me, as part of them ‘knows’ they can’t hide from their truth and spiritual wholeness inside the reading. I experience the same symptoms the days before I see healers I respect. It’s a sign you’re ready for a big shift. *Someone came to me confused about their lifepath (find your lifepath) – they were born at midnight and didn’t know which date of birth to use in numerology. I could have offered them a refund, but instead I prepared two charts for them and asked which felt more accurate. Fortunately, one of the charts was obviously the correct forecast. I’m aware things may not always be so cut and dried for others. Perhaps some of us are not meant to have clear-cut paths – we’re here to find our own ways to Source. *A few years ago, a client said I wasn’t specific enough, which led me to improve my format for future sessions. As a result, I redid their forecast, and am grateful that they spoke up. Part of being a psychic reader is being ‘paid to improve’ – it really is a privilege. I hope you’ve enjoyed this insight into my life as a psychic reader. I’m so grateful to all my clients and ex-clients, for showing me the winding road to self-acceptance. We can only love others, as much as we love ourselves. My job is not to tell you what to do, it’s to unleash your inner voice, and to amplify your heart so you can do what you truly want! Please note, I will be on maternity leave from August/ September 2017. I hope to see you for a psychic reading or numerology workshop before then, otherwise there’s always next year! I’m taking bookings for April to June, so save your spot soon with a $100 deposit. Take care and thanks for your support of this blog.